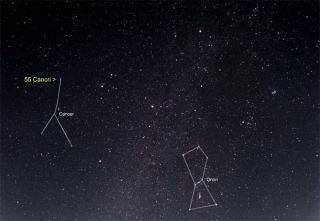 This wide-angle photograph of the night sky shows the location of 55 Cancri, a star where astronomers have found a record-breaking five planets. 55 Cancri is located fairly close to us at 41 light-years away. It lies in the constellation Cancer, and can be seen through binoculars on a clear night. The constellation Orion can be seen to the lower right. Scientists announced today the discovery of a fifth planet in a distant star system that now looks like a "cousin" to our own. Known as 55 Cancri, the sun-like star harbors the most number of planets ever discovered outside our solar system. "We now know that our sun and its family of planets is not unusual," study team member Geoffrey Marcy of the University of California, Berkeley told reporters in a teleconference. Four of the planets had been previously detected, but the existence of the fifth planet took 18 years to confirm. It is about 45 times more massive than Earth and might be similar to Saturn in its composition and appearance. 55 Cancri is located 41 light-years away in the direction of the constellation Cancer and is visible with binoculars. The system contains a clutch of four inner planets that are separated from an outer planet by a huge gap. "We haven't found a twin of our solar system, because the four planets close to the star are all the size of Neptune or bigger," Marcy said. Although more than 250 extrasolar, or "exoplanets," are now known, only one other star, mu Ara in the southern sky, is known to have four planets. Astronomers expect many multi-planet star system to be found as technology improves. The newest member of Cancri 55's family lies within the star's habitable zone, the region around the star within which water can exist in its liquid state. Though the planet is a giant ball of gas, liquid water could exist on other, currently undiscovered rocky planets in the system. Marcy said he's optimistic that continued observations will reveal a rocky planet around the star within five years. Such a potentially habitable planet could reside in the nearly 700 million-mile (1.1 million-kilometer) wide space that separates 55 Cancri's four inner planets and its outer one. "I would bet you that gap isn't empty," said study team member Debra Fischer of San Francisco State University. "What we see in our solar system is that we are full up on planets. There are very few tiny windows where you can drop even a moon-sized object in and have it survive in a stable orbit. "If there were a moon around this planet, it would have a rocky surface," Marcy said. "Water on it could in principle puddle into lakes and oceans, serving as the solvent for biochemistry. Alan Stern, associate administrator for the Science Mission Directorate at NASA headquarters in Washington who also was not involved in the study, said "it is amazing to see our ability to detect extrasolar planets growing. The planets were found using the Lick Observatory and the W.M. Keck Observatory in Hawaii using the so-called radial velocity, or "wobble," technique, whereby the presence of planets are inferred by the way they gravitationally affect their parent star's orbit. The newest world will be detailed in an upcoming issue of Astrophysical Journal. "Finding five extrasolar planets orbiting a star is only one small step," Marcy said. "Earth-like planets are the next destination."